When this card is successfully Normal Summoned, put 1 Spell Counter on it (max. 1). Increase the ATK of this monster by 300 points for each Spell Counter on the card. Also, you can remove 1 Spell Counter from this card to destroy 1 Spell Card or Trap Card on the field. Shorter review today. 1600 ATK is hot. 1000 DEF is meh since Witch is gone. Repetition. DARK? Hot. Spellcaster? Meh. Oh look, Spell Counter. ATK increase and built-in MST? Hot. I think I'll include one in every deck I build. Oh noes, cookie cutter! If MST wasn't restricted, then we wouldn't need this guy as much. We're getting Chiron the Mage with FET (although discarding spells HURTS), we already have Mobius, Heavy, MST, and Dust Tornadoes...but given that you can kill the M/T the turn this guy comes out, he's still too valuable to pass up. 1600 holds its own, and 1900 is great against things other than pure beatdowns. I can't remember how many times I've Witched this thing in Traditional. 4.9/5 all-around -- M/T kill and a decent monster is just too great not to deck. If you’re running a deck based around attacking, you should probably be running Breaker. 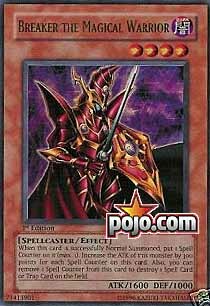 Today’s card is Breaker the Magical Warrior, the most popular Spellcaster in the TCG. What can be said about Breaker that most don’t already know? To review for those who’ve forgotten, when Breaker is Normal Summoned his ATK increases from 1600 to 1900, due to a Spell Counter he gives himself. Spell Counters, in case you’re wondering, are much like Tokens. They can be represented by anything you have available; pennies, cereal, dice, etc. Of course with Breaker, it’s unlikely you’ll need to keep track due to the fact he can have no more than one Spell Counter at any given time. By removing the Spell Counter from Breaker (and thus returning his ATK to 1600) Breaker can destroy 1 Spell or Trap Card on the field. Needless to say Breaker is considered by many to be a monster staple, and shouldn’t require much more explanation. Breaker is used in basically every Deck, and for good reason. I’ve been trying to remove him from my Decks, but I think I’m fighting a losing battle… See ya’ll for the lengthy review tomorrow! Advanced: 5/5. Spell and Trap Card destruction is a little scarce, so Breaker is welcomed wherever he is available. Art: 4/5. It’s a cool picture, but it’s also a little dark (as in hard to see). Ah, good old Breaker. What a monster he is and oh how important especially in Advanced. Obviously, Breaker's magnificence lies in his Special Ability. By discarding the one Spell Counter that was put on him, you can destroy one magic or trap card on the field. This effect is similar to XYZ Dragon Cannon except for his effect you discard one card from you hand. However, sadly, by using Breaker's special ability, he loses 300 attack points. This isn't the end of the world, but now Breaker can't compete with the other beatsticks. In the end, it isn't all that big of a deal. We finally did get to see Breaker in the anime when the Pharoh dueled Weevil this season. Advanced: 4.7/5 A bit more useful here. Art: 4.5/5 He almost looks evil.